Today’s economy is properly digital. Many of us spend all day at a computer and then come home to order groceries online, chat with friends online and research a good plumber online. It takes a huge amount of infrastructure to keep all those businesses ticking and to keep improving them as our expectations continue to rise. What chance does a business have that doesn’t have a snappy, engaging website with easy e-commerce functionality? When I was a teen in the 1980s, I was fascinated with all kinds of technology and gadgetry. I shared this passion with my dad and with my sister, who was working on her PhD in Computer Science at the time. My dad bought a TRS-80 computer from Radio Shack, complete with lightning-speed cassette tape drive (remember those?) and dot matrix printer. We couldn’t believe, or even imagine, the reach, the power, the potential. Well, it was hard to beat. We knew we had to get our heads around our semicolons and our commands to get anything fun to come up on that black screen. And so we learned to operate from the command line, cracked through a decent amount of programming, and voilà, a generation of coders and tech entrepreneurs was spawned that delivered better hardware, better software, better interfaces, smaller chips, and thus transformed the global economy. Most of us lived this through the interface. It went from black to white, as Macintosh introduced the first graphic interface ‘portable’ computers (and when I say ‘portable’, technically it could be carried, though not easily or attractively). Then moved to blue as Microsoft adopted the GUI interface that made the command line the domain of the IT people rather than the normal user. After that came whizzy graphics, eventually X-Boxes for games (sorry Pong! ), beautiful MacBooks, and amazing touchscreen Surface interfaces. We were amazed that two-year-olds could use iPads and declared the new generation Digital Natives, never knowing a world without technology. But, in the midst of all this easy-to-use technology, somehow we lost touch with the fact that someone has to build it all. And the kids have become consumers, sitting slack-jawed and motionless above the wrists for hours, killing baddies but never knowing the thrill of summoning the code-driven genies themselves. I write in jest but really, it’s no joke. Today it is estimated that more than 800,000 jobs in IT are unfilled in Europe because there simply aren’t the people with the necessary skills. Computer science classes have been second-class citizens – focusing at secondary school level on using boxed products until recently, and according to the latest statistics, 82% of computer science students are male. If the beauty of the interface means that the coders go extinct (or very very narrow) in our country – has the monster eaten its own tail? In short, yes! 800,000 times yes. So how can we halt this decline? 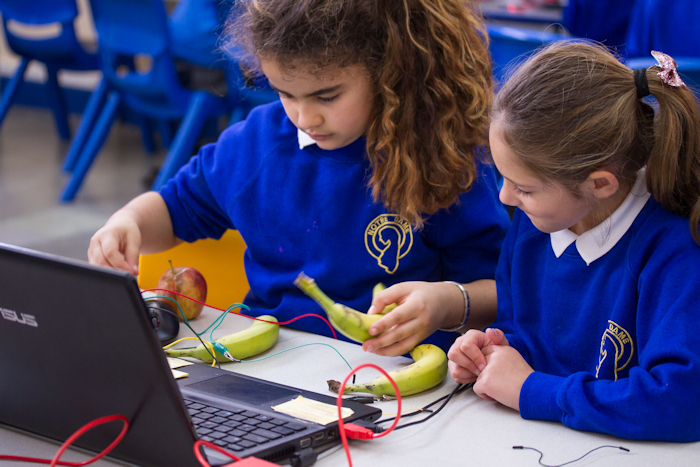 It’s simple – let’s get young people excited about coding. That shouldn’t be too hard – there’s never been a more exciting time to become a digital maker. The national curriculum now focuses on coding, so all students should get at least some basic exposure. 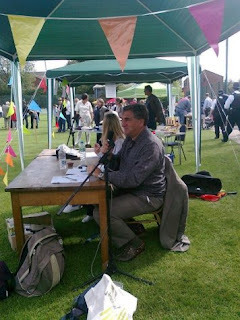 Out of the classroom there are Raspberry Pi’s, Code Clubs, Raspberry Jams, Bafta Young Games Designer Competitions and CBBC Airmageddon shows to get and keep kids interested. Trends are changing, with computer science now the most popular ‘major’ among women at Stanford University. 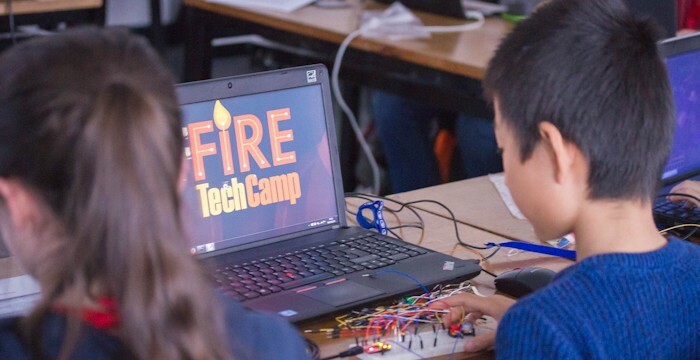 Tech camps provide courses during holidays, and outside of school to students from 9-17 years old, with something to appeal to kids of every stripe. 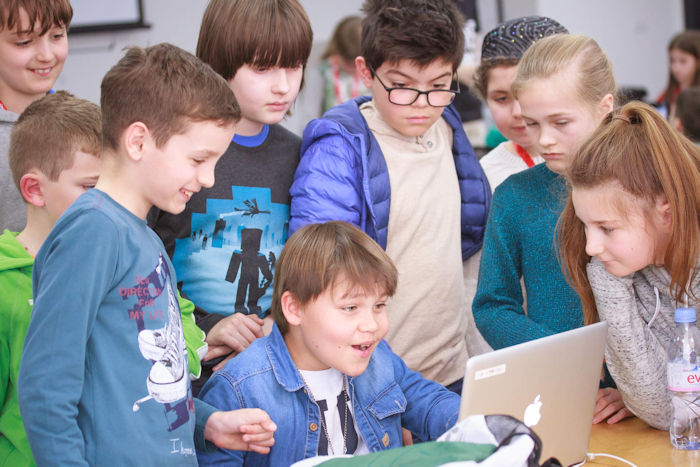 Kids participating in all kinds of coding activities are coming away with a new community of friends, inspired to create, and skilled-up for the world they live in. We need a generation of inspired, risk-taking, code-literate innovators to keep the UK at the forefront of problem-solving, art, voice-lifting and the digital economy. Our future depends on it so come on, let’s get those kids coding! 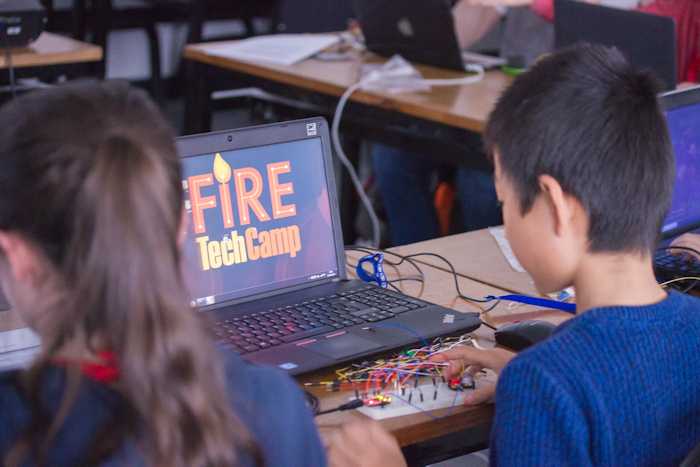 Fire Tech Camp is the UK’s leading tech and making holiday activity provider for kids and teens. We are shaping the next generation of entrepreneurs and inventors. Summer camps are running from 11th July-26th August at South Hampstead High School, Imperial College and Fab Lab London. For more information and to book please visit firetechcamp.com or call 0207 193 4002.